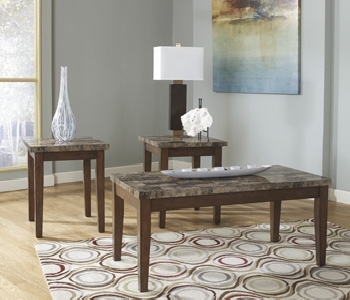 The rich contemporary style of the Theo accent table collection combines faux marble and a warm finish to create a collection that adds an exciting style to the decor of any home. The thick table tops are a beautifully patterned faux marble that perfectly accentuates the straight-lined contemporary design of these tables. With the warm brown finish bathing the aprons and legs, the inchTheo inch accent table collection is a refreshing addition to any living room environment.